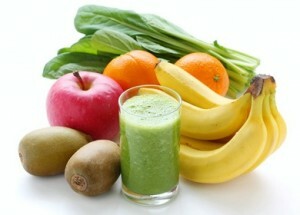 Kermit the frog said, “it’s not easy being green.” The same thing may be echoed by highly nutritious green smoothies. Many people shy away from green smoothies simply because they are green. However, it is the green component of these drinks that make them such a tremendous asset to overall health and well-being. There are many reasons to include green smoothies in a healthy diet. Blending greens and fruits ruptures their cells, which makes valuable nutrients readily available to the body. Absorption of these nutrients begins in your mouth. Green smoothies are a complete food because they contain fiber, which helps keep you regular, and adds bulk which keeps cravings at bay. Another reason to consider going green is for the benefit of the chlorophyll. Chlorophyll is very similar to hemoglobin and helps to provide instant energy by rebuilding and replenishing red blood cells. The perfect green smoothie has three parts, liquid, greens and fruits. For the beginner smoothie drinker, 60% fruits, 40% greens and one cup of liquid is a good place to start. The liquid part must be added first in order for the drink to be blended smoothly. There are several choices for liquids, but a good starter liquid is water. Don’t use city water, as this has impurities, chlorine and fluoride. Use only pure spring or filtered water. A tropical twist is easy when you add coconut water; be sure to choose only organic coconut water. Green smoothies are an excellent detoxifying drink, and adding animal milk can interfere with the detox benefits. Greens are an excellent source of calcium, so you can always add more greens. If you really want to add some kind of milk, consider organic almond milk. The next step to the perfect smoothie is to pick your greens. Some popular options include romaine lettuce, spinach, parsley, bok choy, lettuce, cabbage, kale or even dandelion greens. Experiment with different types of greens until you arrive at a “just right” taste. You can also add in spirulina or chlorella powder. Adding fruit to your green smoothie gives it a nice rich texture and a somewhat-sweet taste. Juicy fruits such as oranges and grapes will make your smoothie rather pulpy. Great base fruits include banana, mango, peach and papaya. Add a little citrus or even grapes on top of your base fruit if you enjoy the taste. Avocado or coconut meat are great if you want a thicker smoothie; they add healthy fat, which will balance out the fructose in the fruit. Greens take a little getting used to as they can be kind of bitter. At first you may want to add a little sweetener. Stevia or coconut crystals are both good options because they do not have a huge impact on blood sugar. Next articleKraft Macaroni and Cheese Ingredients Banned Overseas, Not U.S.
Hey Buddy!, I found this information for you: "3 Steps to a Fabulous Green Smoothie". Here is the website link: https://www.thealternativedaily.com/3-steps-to-a-fabulous-green-smoothie/. Thank you.